Dec 11, 2015 Thank you for your review. 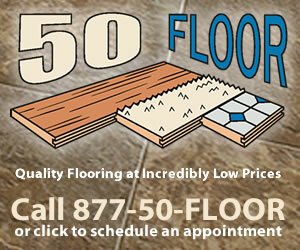 We’re so happy you decided to choose 50 Floor for your flooring needs. Please feel free to give me a call directly to address any floor concerns you may have. I waited 4 wks. for my floors after they tore up carpet and left. Office and managers were rude and had one excused after another. The installers were great no problem. Management will not return calls and lie. Talked to 3 different people about when they would come and install, but no one had a answer. Never go with them....go local! The installers also said the company had fired several people in the 4 wks that I was waiting and trying to get an answer on why they were so late with my floors. I was told they would install Sept 23, well they tore out carpet and left said they. Finally on Oct 16th a second crew from Atlanta came to help out. The first crew was fired! I liked: Installers, Second round of installers. I didn't like: No calls back, Installation, Unsatisfied. Review #718711 is a subjective opinion of User718711.